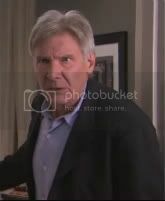 Harrison Ford was a guest on the “Jimmy Kimmel Show” recently and Kimmel could not let such an opportunity go by without filming one of his hilarious, sometimes shocking, video sketches. Well, we have it for you (below), and it is already making its rounds on the web (it has more than one million views on YouTube). I am sure with Harrison Ford going around promoting “Cowboys and Aliens” it wasn’t hard getting him on-board to make one of these, seeings other Jimmy Kimmel videos did so well and got so much buzz. But what makes this particular video even cooler is the reunion of Ford — playing Han Solo — and a guy in a cheap Chewbacca suit and their hilarious dialogue, which really makes it seem these two “Star Wars” characters haven’t seen each other in a long time and are truly begrudging each other. The clip is less than a minute, and it’s starts out with Harrison Ford as himself, but when the Chewbacca character appears, it seems Ford is talking as if he was Han Solo. It is hilarious and you need to check it out. I crack up every time I watch it, but what really does it for me is how easily Ford switches characters and goes into Han-mode. He really does talk just like Han here, it’s sent shivers down by spine. Seriously, Harrison Ford is still Han Solo, and still one of my favorite actors. Follow Josue Sanchez on Twitter at http://twitter.com/_Josue__. He definitely goes into Han Solo mode. That’s pretty cool to see.